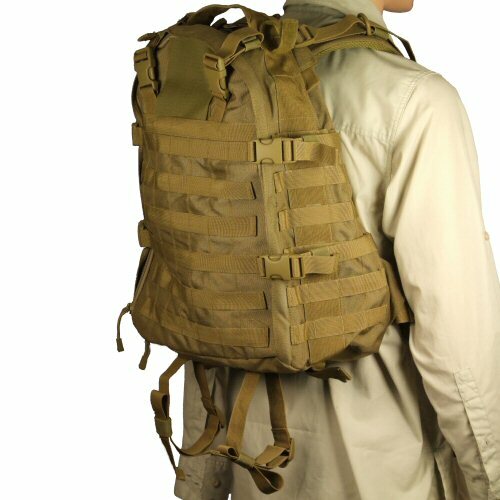 The Bulle MOLLE tactical 72 hour pack is a fully MOLLE compatible, front loading pack with extra long 3/4 length zipper enabling items to be drawn from either top or bottom or sides of rucksack. The front, sides and underside are fitted with PALS webbing to enable extra pouches to be added wherever required. The sides also have six compression straps on quick release buckles which help to keep the contents under control. In the interior, there is one large main compartment with internal strapping to help hold contents in place, and a thin document pocket on the inner side of the opening flap, as well as a thin pocket on the back. This can be used to carry a hydration bladder if required. Antenna loops are located on the top to allow an antenna to protrude. A name window is on the inside of the pack, and a large patch of velcro is provided on the outside for name tapes, nationality and unit insignia. The shoulder straps are fully padded and highly adjustable. Hip pads are also provided with MOLLE webbing to enable magazine or utility pouches to be placed on the hip area. 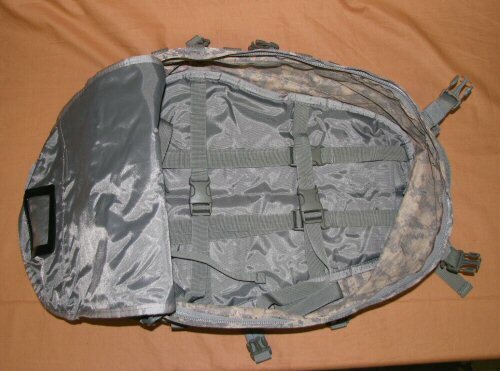 Side view of the ACU version of the rucksack. Additional large utility pouches can be mounted on these side MOLLE webbing straps, effectively giving the rucksack side pouches. This will not interfere with the opening of the rucksack as this is via the zipper on the front only. 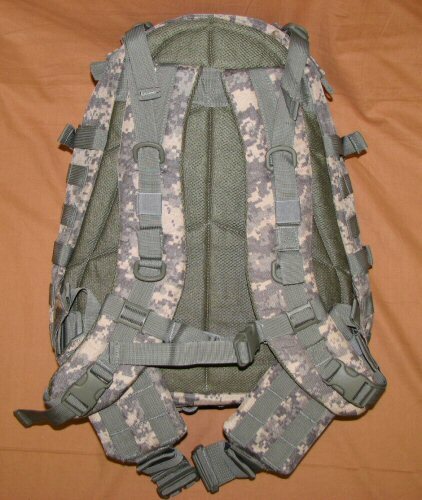 View of shoulder strapping and hip pads on the rucksack. The shoulder straps have extra D-rings for carrying View of shoulder strapping and hip pads on the ACU version of the rucksack. The shoulder straps have extra D-rings for carrying hydration or comms leads, and an adjustable chest strap is also provided. The back of the rucksack is padded for comfort. The hip pads have MOLLE to allow for utility and ammunition pouches to be carried on the hips. These are clipped together with a large 50mm wide Duraflex quick release buckle. The shoulders straps also have adjustable strapping on over the top, and this helps to keep the weight evenly distributed on the upper back and waist of the pack, rather than having all the weight sagging towards the lower back, waist and hips. 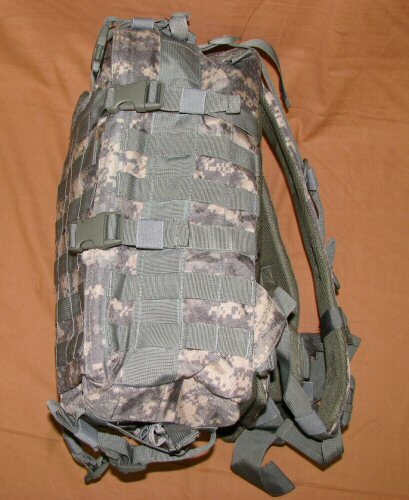 View of interior of ACU version of the pack, showing how the front loading works. The zipper is a double zipper and so the back can be opened from the bottom, sides or top. Also shown inside are the adjustable straps on the interior that help to keep the contents in place. The name window is visible on the top flap, as is the document pocket. Another thin pocket is located on the back of the pack which can hold a hydration bladder or similar item.